Digal announced that Bank Leumi has approved its improved offer to settle its debt. 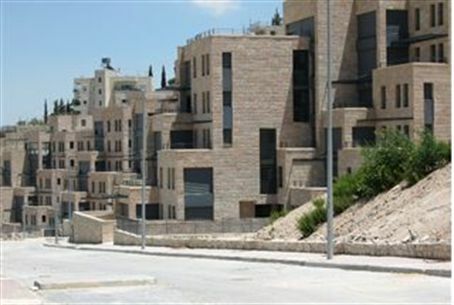 The Nof Tzion apartment project in Jerusalem has cleared what may be the final hurdle on its way to becoming a Jewish neighborhood. Digal, the project's developer, revealed in a statement to the stock exchange Tuesday that Bank Leumi has approved, in principle, an improved offer by the firm for settling its debt to the bank. The meaning of the announcement is that the bank has given the go-ahead for a deal in which the parcel on which Nof Tzion stands will be sold to businessman Rami Levy and an American partner. The two will complete construction of the planned neighborhood and market the remaining homes to religious buyers. The first phase of the project, which houses 90 families, was completed several years ago. However, Palestinian Authority semi-resident Bashir Al-Masri has been making efforts to buy Digal, and has confirmed that if he succeeds, he intends to market the 180 planned units of Stages II and III of the project to Arabs. The latest development became possible after Levy made an improved offer to Digal Tuesday morning.